Twentieth-century airplanes generated a lot of data – about the engine systems, fuel use, crew activity, and even weather systems they encountered. But airlines and airports had little to no capability to do much of anything with it, and most of the information could not even be transmitted in real time. Today, through thousands of sensors and sophisticated digitized systems, the newest generation of jets collects exponentially more, with each flight generating more than 30 times the amount of data the previous generation of wide-bodied jets produced. While currently only about one‑tenth of the global fleet is made up of these technologically advanced aircraft, in a decade more than half of it will be. By 2026, annual data generation should reach 98 billion gigabytes, or 98 million terabytes, according to a 2016 estimate by Oliver Wyman. The newest generation aircraft by then will be spewing out between five and eight terabytes per flight, up to 80 times what older planes today generate. Yet, airlines and airports still have only limited capacity to process this trove of information and use advanced analytics and artificial intelligence to help inform operations and maintenance – and almost never in real time. Discussing the connectivity of a plane usually revolves around whether passengers can get Wi-Fi signals that let them do their work or stream their favorite entertainment. While this is no small amenity – with 85 percent of passengers saying they would connect to free Internet if available – the potential of connectivity could extend so much farther. With the data provided by the newest aircraft, fuel consumption, crew deployment and flight operations could be optimized to account for varying conditions; maintenance could anticipate when parts need replacing; air congestion could be reduced; flight routes could be altered well in advance of takeoff to avoid storms; systems could back up pilots by handling routine cockpit tasks; and passengers could be kept informed about schedules and options from the minute they leave their home for the airport. It would make the planes easier to fly and maintain and more efficient. It also may reduce crew fatigue with more precise scheduling and fill in gaps from anticipated pilot shortages. Ultimately, the data could help with the next iteration of aircraft by providing information about how designs and systems perform and ways they might be improved. 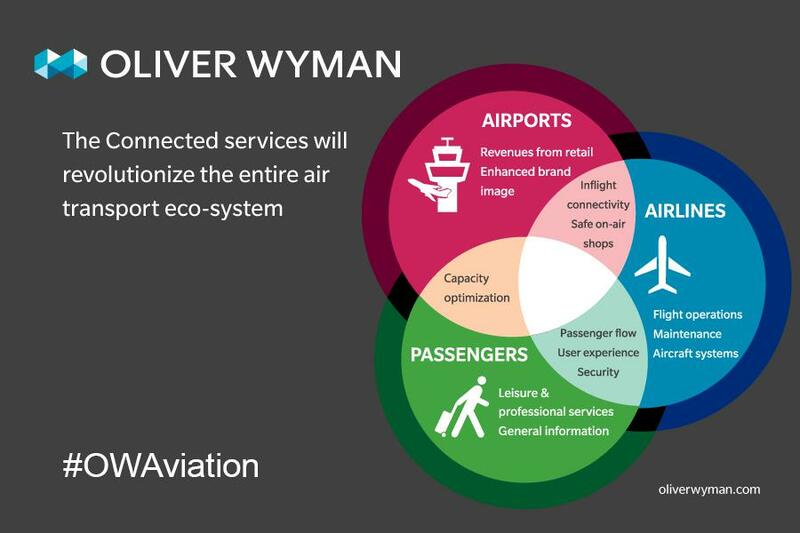 The new connectivity and advanced analytics also mean savings for airlines; Oliver Wyman’s estimate is between 2 percent and 2.5 percent of total global operating costs, which translates to something between $5 billion and $6 billion annually. And while it may take several years, even a decade, to realize all of these possibilities, aviation is on the cusp of a data science revolution that will transform almost every aspect of the industry and provide its managers better control. The question industry players must ask themselves is whether they will be leaders or followers. Where artificial intelligence and advanced analytics can play the biggest role is dealing with the unpredictables the industry faces daily. With hundreds of planes, thousands of flights, and millions of employees and passengers, there is now too much data and too many variables for humans to sort through fast enough to fix problems or even prioritize potential threats. From big events like hurricanes and snowstorms to smaller disruptions like air traffic control delays, mechanical failures, or even lines of thunderstorms, computers and analytics are necessary for . While much of this activity today is mostly reactive, the next step will be for aviation to proactively avoid some of the delays, congestion, and inefficiencies that annoy passengers and keep the global industry at single-digit profit margins. Plane connectivity is a win-win for airlines, airports, and passengers. Starting to make this future a reality are aircraft and engine manufacturers like Boeing, Airbus, General Electric, Bombardier, and Safran, as well as parts makers and systems designers like Honeywell, which are starting to create a business out of the collection and analysis of the data being generated by aircraft. Then, there are also the data analytics experts like Google and Microsoft, which also are making a play for some of that pot of potential revenue. Airlines, however, won’t be willing to hand over large chucks of their operations and potentially profits to their suppliers. A couple of pioneers have begun to digitize what have been incredibly manual processes involving plane maintenance data and schedules. By doing this, they’re hoping to avoid situations that can wreak havoc on flight schedules where the plane shows up at 7 p.m. for repairs, but the necessary parts arrive at 7 a.m. the next morning or vice versa. Maintenance represents a $9.1 billion expenditure for the four largest US airlines, for instance, so anything that can contain growth of such a substantial cost center – or even reduce it – would fall straight to the bottom lines of carriers. Using predictive maintenance – a protocol that allows airlines to anticipate when parts will fail in order to make their replacement more efficient – becomes a possibility when planes are fully connected to airlines and maintenance shops, and data being generated by the planes can be stored in a single database and analyzed. Airlines encounter obstacles when attempting to realize many of these potential efficiencies . They include legacy information technology not flexible enough to accommodate more sophisticated analytics and artificial intelligence systems, and a dearth of mathematicians and engineers in their ranks to operate and understand the more advanced software and its output. The transformation is also expensive, and currently, many airlines will first choose to spend any discretionary dollars on improving the customer experience. While predictive maintenance and other behind-the-scenes efficiencies would smooth out operations and result in fewer delays and inconveniences, the visible customer amenities that help keep customers happy and occupied, such as better Wi-Fi connectivity, may influence passenger decisions more, and strong Wi-Fi connections can save airlines the cost of installing seatback television screens. For instance, JetBlue and Amazon have a partnership that allows Amazon Prime members to stream Amazon videos on Jet Blue flights with a Wi-Fi connection Amazon sponsors. Of course, an enhanced customer experience is the biggest anticipated payback from the connected plane, according to a global survey that shows close to 50 percent of airline respondents putting that first among advantages. Connectivity will allow for the integration of loyalty programs into crew-issued tablets and other hand-held devices and enable two-way crew communications with the airline operations center. Flight operations will benefit from the shift from legacy data link systems to modern broadband; the integration of live flight routes and performance systems; the enabling of real-time graphical weather maps; and the facilitation of turbulence mapping, to name a few. Even for airports, there is great potential for revenue generation. First, with the right data, airports could begin to establish brand recognition and a closer relationship to passengers, working with airlines to help their customers get to airports and gates more efficiently and hassle-free. They also could inform passengers about how to spend their waiting time more productively, letting them know about shopping and dining opportunities and places suited for families or work. Connectivity is one of those rare win-wins for the industry, making flying more efficient, safer, and ultimately more pleasant. Now, the investments need to be made. Vik Krishnan, a San Francisco-based partner in Oliver Wyman’s transportation practice, Geoff Murray, a Chicago-based partner in the same practice, and John Smiley, an Atlanta-based senior manager for transportation, contributed insights and research to this article. This article was written by Oliver Wyman from Forbes and was legally licensed through the NewsCred publisher network. Please direct all licensing questions to legal@newscred.com.